This is a guest post by Amanda McLoughlin, co-host of a few podcasts, host of a youtube channel, somehow a full-time job, and more. She’s busy. Here’s her recipe for a new start on the new year. What do you want to accomplish this year? Start a new project, or make progress on an existing one? Maybe you hope to achieve better work-life balance or start down a path to a new career altogether. The point of a Brain Dump is to capture the full picture of everything you need and want to do. Once you have all of your projects, goals, obligations, and dreams down in one place, you can prioritize better and get more stuff done. So, how do you start? Set aside one calm hour—first thing in the morning or after dinner once you’re home from work—and gather your materials. You can use paper, notecards, a whiteboard, a Word document; any medium that will let you get ideas out of your brain as quickly as possible. 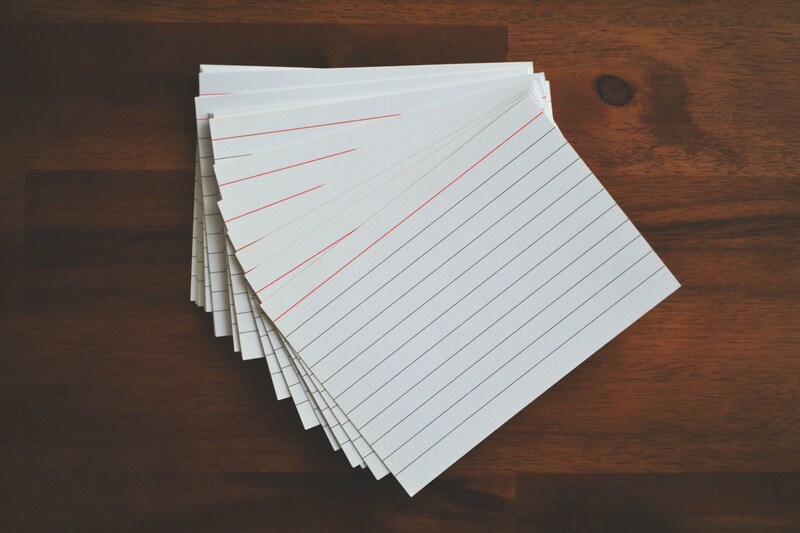 I like using index cards that I can move all around the table, but do whatever works best for you! Now, start writing everything down. That means all of your to-do items, work projects, housework tasks, texts to return, “wouldn’t it be nice if I…” ideas—everything! Even include things you’ve put on hold or are waiting for other people to work on with you. Write it all down. Let your brain jump around! Don’t worry about going from “return library book” to “figure out new payroll system.” Walk through a typical week in your mind and let your routine trigger you to write down new things. What do you need to do at home? What do you think about on your commute? When you get into the office, what stresses you out that you might be able to change? What do you keep apologizing for not having gotten done? Once you’ve written down everything you can think of, take a break. Go about your day while add items as they come to you on a notecard or a note taking app. As you go to work, come home, or visit your studio, these locations will trigger your brain into remembering more tasks. Carry the list around for a day or two and add things as they come up, but don’t read or review it. Next, it’s time to group your items. Take a look at everything you’ve written down and start to think about what groups make sense for your tasks. You may change these groups over time, so just choose the simplest ones to begin with. Mine include work, podcasts, personal administration, housework, friends/family, and relaxation/hobbies. 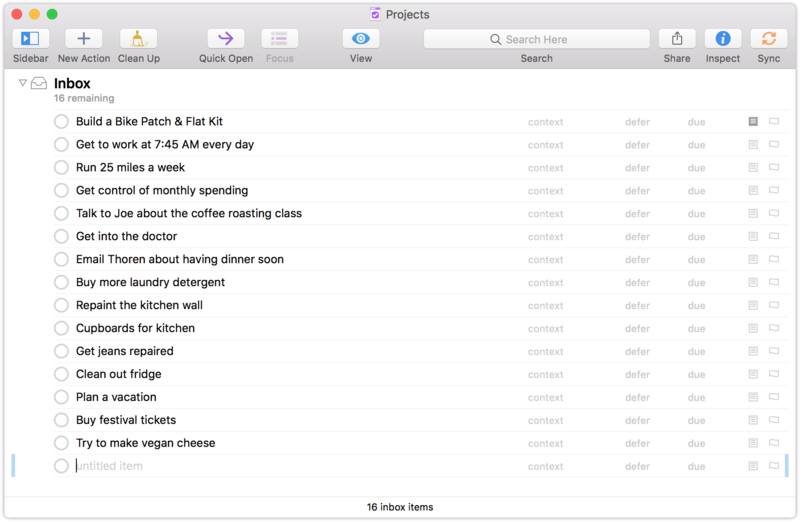 Of course, OmniFocus also allows you to assign contexts to your tasks, which is a handy feature that allows users to sort tasks based on where/how you do them. You might have contexts for work vs. home, pen & paper vs. computer, or online vs. offline. My contexts sort my tasks by location (neighborhoods in NYC), states of mind (“detail,” “writing,” “long term planning”), and tools needed (“online,” “phone,” “audio” [reviewing + editing podcasts]). And… congratulations! You just finished a Brain Dump! It may initially feel overwhelming to see everything you need and want to do spread out in front of you. But, I promise, you’ll also feel accomplished and in control. Once you understand the full picture of your life, you can start to prioritize and set goals in a smart and informed way.